Here I am with the sculpture that Anne Gregersen and I built. It is entitled Through a Glass, Darkly. Here is our artist statement. 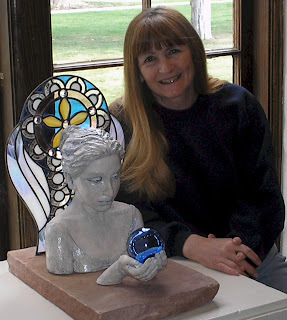 One day after the yoga class we both attend, we talked about collaborating on a piece of art, combining our respective mediums of glass (Jeanne) and ceramic sculpture (Anne). This sculpture is the result of that collaboration. Firmly grounded in the earthy present moment, the figure ponders a yet mysterious future as she gazes into the glass ball. Behind her, light and pattern convey a feeling of another place and time, sensed but not remembered. 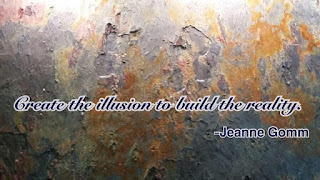 Our yoga practice involves both the body and the spirit. We tried to capture some of that feeling in this sculpture. We were happy to have it accepted in the Spring Salon at the Springville art museum. Please go visit it and all the wonderful artwork there if you are nearby.